Sofia2 from Andrew J. Schuman on Vimeo. For many years primary care physicians have been using lateral flow assays to diagnose strep A, Influenza A and B and RSV infections at the time of an office visit. These have the advantage of being inexpensive and relatively fast. When positive they expedite diagnosis. Their disadvantage is that negative tests do not necessarily rule out infection as their sensitivity ie their ability to detect a positive when the antigen is present can be low. In the case of strep A lateral flow rapid antigen detection tests the sensitivity may be 85% or less. In the case of flu tests sensitivities may be 60% or less, and some RSV tests have sensitivities only around 70%. Point of Care (POC) PCR tests have improved significantly upon the accuracy of rapid detection of strep A, influenza A and B as well as RSV. 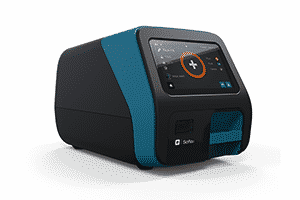 Please see Medgizmos review of the Alere I System here for a full discussion. The downside is that the tests are much more expensive than traditional lateral flow assays, and not all insurances will reimburse for these more accurate tests. 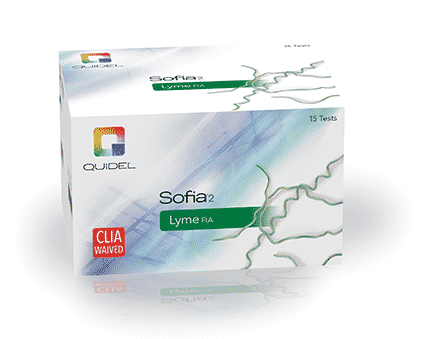 The Sophia 2 analyzer from Quidel, represents an “enhanced” lateral flow assay. It provides much improved sensitivity for detecting the pathogen being screened for compared to traditional lateral flow assays – but is much less expensive than POC PCR assays. Keep in mind that with the Sophia 2 system, negative rapid strep tests still need to be backed up with culture in children, with negative PCR tests they do not. So, if one were to factor in the cost of the rapid test and the culture, the point of care PCR strep A test is the most cost-effective assay. The Sophia 2 is an elegant device to say the least. It has a touchscreen display, and it is very easy to run monthly controls for all test kits. It features 1) a “test now” mode where you insert a cartridge into the device for testing once you run the test for the necessary time, or 2) a walk away mode, where the cartridge is inserted once the test solution is deposited. New this year is the first ClIA ‘88 waived fingerstick blood assay for Lyme IgG and IgM antibodies, providing results in 15 minutes. Positive tests require confirmation with a Western Blot analysis as you are aware. Check out the video above for an overview of this analyzer. If you agree to use a reasonable number of assays per month Quidel will provide the analyzer at no cost to your practice.